The Florida Department of Financial Services' Division of Consumer Services continuously monitors the insurance and financial industry to inform and protect consumers from various financial scams designed to steal your hard-earned money. If you or someone you know has been a victim of a financial scam please call 1-877-MY-FL-CFO (639-5236) or REPORT FRAUD now. To view a listing of common Fraud and Scams, click here. According to the Federal Bureau of Investigation, a malware called botnet (referred to by the FBI and cyber security researchers as “VPNFilter”) has given hackers unauthorized access to routers and internet-connected storage devices, allowing them to search for sensitive information on the device. The botnet uses several stages of malware. Although the second stage of malware, which has the malicious capabilities described above, can be cleared from a device by rebooting it, the first stage of malware persists through a reboot, making it difficult to prevent reinfection by the second stage. The threat is estimated to have infected approximately 500,000 routers worldwide. Experts believe that the hacks originated from Russia. Owners of routers and storage devices that may be infected should reboot their devices as soon as possible by unplugging the router and waiting 30 seconds before reconnection, temporarily eliminating the second stage malware and causing the first stage malware on their device to call out for instructions. Although devices will remain vulnerable to reinfection with the second stage malware while connected to the internet, these efforts maximize opportunities to identify and remediate the infection worldwide in the time available before hackers learn of the vulnerability in their command-and-control infrastructure. For more information on how to protect yourself from becoming a victim of fraud, visit the Division of Consumer Services Frauds & Scams website. On September 7, 2017, Equifax announced that it experienced a cybersecurity breach that exposed the personal and financial data of approximately 143 million consumers. Equifax is one of the three major credit reporting agencies responsible for collecting and compiling the credit history of consumers and businesses. The breach occurred between mid-May and July. The hackers obtained names, Social Security Numbers, birth dates, addresses and driver’s license numbers. Actively monitor your credit report for any suspicious activity or new lines of credit opened in your name. A free credit report can be obtained from each credit reporting bureau – Equifax, Experian and TransUnion - at www.AnnualCreditReport.com. Dispute, in writing, any accounts that you deem unauthorized or suspicious. Monitor your bank accounts and credit card statements to ensure no fraudulent purchases have been made. Dispute any unauthorized charges with the company immediately. Do not disclose any sensitive information to individuals who call unsolicited claiming to represent your bank, credit card company or the IRS. They will not call to request personal or financial information such as your bank account or Social Security Number. Hang up and call the number you know to be associated with the company. You may wish to place a credit freeze on your credit report, which will eliminate anyone from opening a new account in your name, or a credit alert, which ensures you are contacted if anyone attempts to open a new account in your name. For more information on the Equifax data breach, visit https://www.equifaxsecurity2017.com/. For tips on how to protect your identity, visit the Division’s Identity Theft page. The Centers for Medicare and Medicaid Services (CMS) is warning seniors of fraudulent calls to pay for a new Medicare card or to verify personal information for a new card. 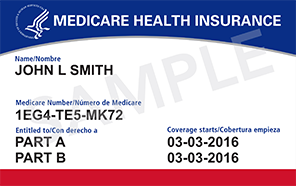 CMS is redesigning Medicare cards in an effort to fight identity theft; Social Security Numbers will no longer appear on the cards. Beginning next April, CMS will automatically begin mailing its 58 million beneficiaries a new card with a unique number that will be used to identify them. While the mailings will begin in April, Congress has provided CMS with a deadline of April 2019 for all beneficiaries to have received a new card. Guard the current Medicare card that, if obtained by a scammer, can be used to fraudulently obtain medical services or medications. Do not discard of the current card until you have received a replacement. Once you’ve received a replacement, shred the old card. Do not provide financial or personal information to someone asking for payment to obtain a new Medicare card or to verify personal information to receive the card. CMS will automatically send a new card at no charge and no verification of personal information is required. For more information on the new Medicare cards, visit www.cms.gov/newcard. Visit the Division’s Operation S.A.F.E. and On Guard for Seniors sites for more tips on how to prevent becoming a victim of a scam. You may also visit the Operation S.A.F.E. site to request a free, in-person Be Scam Smart workshop. Consumers have notified the Department of calls received from what appears to be a phone number associated with the Department. In a voicemail or live call, the person states that they are able to lower interest rates and requests that the consumer call back. Spoofing technology allows a person to input any name or phone number on the caller id. Unfortunately, preventing the calls completely is nearly impossible, however, you should attempt to avoid or not answer the call or block the number. Another option is to place your phone number on the Florida and national do not call lists. This will reduce the number of telemarketing-type calls but not eliminate them completely. If you receive a call from someone pretending to be from the Department or another governmental agency, do NOT provide any personal or financial information. Hang up and research the number associated with the agency to call and verify the request. Officials in Florida and Georgia are warning citizens to beware of scammers posing as home security system employees to gain access to their residence and personal information. Scammers pretending to be technicians for the security company ADT ask homeowners to let them inside to update their security systems. The scammers then gain information to either fraudulently create new accounts or extend existing accounts without the customer’s knowledge. In Georgia, the suspects showed a door-to-door permit from the City of Thomasville. When confronted by law enforcement, a suspect was only able to show a name tag for identification purposes. A similar door-to-door home security scam has been reported in the City of Perry. Officials warn that groups are going door-to-door to sell home security systems but are scouting the properties for potential burglaries. Before providing personal information to a door-to-door salesperson, the Federal Trade Commission advises consumers to ask potential sales people for identification including their name, the name of the business they represent and the goods and services they wish to sell. Ask for the contractor’s name; address; telephone number; contractor’s license number; state that issued the license and the name under which the license is filed. Tell the salesperson you need time to verify the information with your state Attorney General, local consumer protection agency, Better Business Bureau and state licensing officials. If you believe you have been a victim of a scam involving ADT, contact your ADT provider. Contact law enforcement immediately if you suspect door-to-door scammers in your neighborhood. The Leon County Sheriff’s Office and Tallahassee Police Department warned citizens to be aware of a new trend of financial crimes that target teens and young adults using social media. Scammers befriend a potential victim online, then make an offer of easy money. They ask for banking information and PINs before depositing a forged check or fraudulent electronic payment into a victim’s account. Scammers can then withdraw money before the bank determines that the check or transactions are fake. The victim may be responsible for lost funds and bank fees. DO NOT give out your personal information (Social Security Number, bank account or credit card number or PIN) on social media sites. DO NOT give anyone access to your ATM card. Check your online credit and bank account transactions often and also check the monthly paper statements you receive in the mail. Be cautious when communicating with unknown people on social media. If you have been a victim or have any information about this scam, contact the Financial Crime Units at either the Leon County Sheriff’s Office or the Tallahassee Police Department. The U.S. Department of Veterans Affairs (VA) warns veterans about a fraudulent phone line that emulates the Veterans Choice Program’s (VCP) line. The fake phone number, 1-800-606-8198, is very similar to the correct phone number, 1-866-606-8198, which allows veterans to check their eligibility and ask questions about the program. The fake phone line offers callers a $100 rebate if the caller provides a credit card number. It does not state that the caller has reached the U.S. Department of Veterans Affairs or the VCP phone line. If you are unsure you have reached the correct phone line, hang up and dial 1-866-606-8198. The phone line will state that you have reached the U.S. Department of Veterans Affairs. For more information, view the Veterans Choice Program fact sheet. Many taxpayers will utilize the services of a professional tax preparer to file their returns. Unfortunately, not all tax preparers will have their clients’ best interest in mind. In 2015, the Department of Justice, Tax Division permanently closed the doors on more than 35 tax return preparers due to fraud. Fortunately, the majority of tax return preparers are honest. But, this does not mean you should trust your tax and personal information with everyone. The tips below will help you recognize a fraudulent tax preparer to avoid becoming a victim of fraud. Ensure your tax preparer has a current Preparer Tax Identification Number (PTIN). The IRS requires all paid preparers to have a PTIN. Check the IRS’s tax preparer directory to verify your tax preparer has a PTIN and other credentials. Never sign a blank tax return. A signed blank return allows a scammer to later fill in credits you did not earn. Make sure you review and ask questions about each section of your return before signing it and ensure that your preparer provides you with a completed and signed copy of your tax return. Ask the tax preparer if they offer IRS e-file services. IRS e-file provides for a safe and secure way to file your tax return. Taxpayers receive an acknowledgement within 48 hours that the IRS has accepted or rejected their return. If the return is rejected, the IRS provides a specific explanation of the errors that caused the rejection. This allows taxpayers to make corrections and resubmit their return. Be cautious of a preparer who only requests your last pay stub to file a return. A legitimate preparer will always request your W-2 to file a return. Avoid fly-by-night businesses. You want to ensure the preparer will be available to answer additional questions or correct any mistakes they may have made on your return. Discuss and agree on the fee to file before you begin. Avoid preparers whose fee is based on a percentage of your refund. This tactic allows a fraudulent preparer to increase their commission by claiming credits you are not entitled to. By the time the IRS identifies the mistake, your preparer has been paid and you could owe back taxes. If you have a tax penalty, do not pay it directly to your preparer. Payments should be made to the U.S. Treasury. The tax preparer should provide you with a voucher that you can mail along with your check or money order to the IRS. Electronic payment options are also available, such as a direct withdrawal from your checking or savings account or payment with a debit or credit card. Ask your trusted family and friends who prepares their taxes and whether they would recommend the preparer. For individuals who make less than $64,000 per year, the IRS’s Free File online program does not charge a fee to file a return. Take advantage of free tax preparation from legitimate organizations. Be sure to use a Volunteer Income Tax Assistance (VITA) program in your community. You can verify the company on the IRS’s website. For more information, visit the IRS’s Tax Scams and Consumer Alerts page. The Lake City Police Department is warning residents, specifically seniors who attend church, about a local confirmed scam. According to police, the scammers approach potential victims claiming to be traveling prophets and healers, and ask them to open a bank account to support their travels. The scammers deposit counterfeit checks by mobile phone and ask the victim to withdraw money once the deposits are made. The victim is accountable once it’s determined that the checks are fraudulent. The Lake City Police Department asks the public to be aware of this scam and to not open bank accounts for others. Legitimate faith-based organizations have methods in place to collect donations. Residents should call the Lake City Police Department if they suspect the scam. The Florida Department of Financial Services has recently become aware of a scam in which consumers receive fraudulent checks that are made to appear as if they have been issued by the Department. In some cases, checks appear to be signed with a forged signature of Chief Financial Officer Jeff Atwater. These fraudulent checks have been received and reported by consumers who were not expecting to receive funds from the Department. So far, five checks have been reported to the Department from consumers in Illinois, New York, Pennsylvania and South Carolina. Currently, no fraudulent checks have been reported by Floridians. The checks, with varying values between $1900 and $4000, have all been deemed fraudulent by the Department’s Office of Fiscal Integrity, which investigates the misuse of state funds. View a scanned copy of one of the fraudulent checks. The Department frequently issues checks for a host of reasons, including unclaimed property payments, but the Department will not distribute a check to a consumer without first notifying them. Consumers who receive an unexpected check from the Department of Financial Services that seems suspicious should not attempt to cash it but should report it to Department’s Office of Fiscal Integrity by calling (850) 413–5514. Consumers beware there is a new telephone scam making headlines this year. Receiving unsolicited phone calls is nothing out of the ordinary and scammers are relying on consumers to, unknowingly, commit the new scam. Phone Pitch: You will receive a phone call from a scammer who makes a statement and then asks “can you hear me?”. The caller may identify themselves as a representative for a home security agency, a cruise line company or the Social Security Administration. They may then follow up their greeting by asking if you can hear them clearly. Result: The scammer’s goal is to record you saying “yes.” Your recorded response may then be illicitly used to sign you up for a new product or service and potentially authorize a payment charge. How to avoid the scam: We recommend not answering the phone for numbers that you do not recognize. If you do happen to answer the phone, know that you can hang up the call at any time. Do not feel obligated to answer any questions or provide any personal information over the phone. If you feel that you may have been the victim of this scam, check your account statements and dispute any charges that you did not authorize. The Florida Department of Highway Safety and Motor Vehicles (DHSMV) warns drivers of a traffic citation scam. Here’s how it works: A company posing as the DHSMV demands payment of a citation via email. The citation looks legitimate, including the DHSMV’s logo. The email threatens that if a payment is not made within a certain timeframe, the driver’s license may be suspended and a daily late fee will be imposed. The email contains a link to make the citation payment. If you receive a citation with a request for payment, do not click on the link in the email. To verify if the citation is legitimate, contact your local Clerk of Court or call the DHSMV immediately. If you have made a payment, contact your financial institution or credit card company to refute the charge and take the appropriate financial security measures. The DHSMV and Clerks of Court do not email citations to customers. The DHSMV and Clerks of Court do not require citation payment via email. Citation numbers are always seven alpha-numeric digits. For more information, visit the DHSMV’s website at https://www.flhsmv.gov/. Last year, nearly 75% of Americans planned to travel between Thanksgiving and Christmas. Scam artists attempt to take advantage of individuals who are out of their normal financial routines, spending more money and have lowered their guards. Scam artists attempt to prey on individuals in a numbers of ways and do so even more during the holiday season. Review the following scams and tips to protect your finances this holiday season. Many retailers offer apps to make shopping easier. However, scam artists are taking advantage of consumers’ thrill for finding the best deals and streamlining the shopping experience. Scam artists are also building apps that look legitimate, similar to a company’s official app, and requesting personal information during registration that can later be used to steal a person’s identity. A fake app can also contain malware, which will download a virus on your device, and provide access to personal information. Go to the retailer’s official website to locate and download the app. Read reviews of others who have downloaded the app. If it’s a fake, other consumers are sure to comment. Look for typos, misspellings and bad grammar. If it is an official app, all content should be well-written. Scam artists are depending on consumers who make several purchases during the holiday season but may not be tracking all items closely. Scam artists email a fake receipt or shipping label that appears legitimate in hopes that the consumer will click on it. Clicking on the receipt or label can download malware on the computer or phone and provide the scam artist access to personal information. Do not click on emailed receipts or shipping labels before checking to ensure you made a purchase at the retailer represented. Check to ensure you recognize the sender of the email. Hover over the sender’s email to determine if it’s an email address associated with the retailer. Do not click on any links in the email. Contact the retailer directly to verify that it sent you a receipt or shipping label. Scam artists are aware that people tend to be more generous during the holiday season and are taking the opportunity to scam consumers by creating fake charities. A scam artist may call or send an email misrepresenting a legitimate organization and requesting donations for those in need. Do not click on a link or respond to an email from a charity. Do not provide personal or credit card information over the phone or via email unless you contacted the charity. Do not donate to a charity that you have not heard of. Review the Check-A-Charity site to ensure the charity is legitimate. Only purchase gift cards from a retailer or company authorized to sell a retailer’s gift cards, such as Walgreens, Walmart, etc. Avoid purchasing gift cards from individuals. Check the packaging of the card to ensure it has not been opened or used. Consumers arriving at a hotel without an actual reservation. Paying more for the hotel room than its standard asking price. The hotel being unable to issue a refund in the event of a cancellation. Special room requests not being fulfilled. Avoid these potential problems by doing research and being diligent in checking details when booking a hotel online. Verify that you are booking directly through a hotel’s website before providing credit card information. Be sure the hotel site is secure. To determine if a site is secure, look for https in the URL (the “s” stands for secure) or the lock symbol near the URL or at the bottom of the webpage. Be aware that if you call a phone number listed on a third party booking site, it may direct you to a call center where employees from the booking site act as representatives of the hotel. Look up the hotel’s direct phone number. Monitor your loyalty accounts regularly, just as you would a bank account, for any unauthorized or unrecognized activity. Be sure to protect and update, frequently, your online passwords. Diversity your online account passwords from account to account and be sure to use easy to remember, yet hard to guess, unique passwords. Confirm with the driver that the meter and card machine are working. Travel in official and licensed taxis or through trusted ride sharing companies. A driver may try to take advantage of your unfamiliarity with an area and you not knowing the best route to your destination. To avoid a driver taking a longer than necessary route, plug in your destination to a smart phone GPS and pay attention to the route the driver takes. If you believe this is taking place, voice your concern to the driver. Free Wi-Fi networks are a very common and tempting service at airports, cafés, restaurants, etc. It is extremely important to use caution if using these networks, as scam artists may create fake, free networks to lure you into signing on and accessing sensitive files, bank accounts or any personal information you may be viewing on your device. Scam artists will attempt to give their network an official or legitimate sounding name and even go as far as to set up a Wi-Fi network that requires payment in an attempt to make you believe it’s legitimate. Ensure the Wi-Fi network is legitimate before inputting sensitive information. The network’s name may be posted in the establishment or available if requested. If you have doubts about a network’s legitimacy, locate an employee and ask for the correct network name and password. Avoid Wi-Fi networks that are open and do not require a password. If possible, wait until you get back home or to a family member’s house before accessing personal, sensitive information. The Department of Financial Services (DFS) and the Office of Insurance Regulation (OIR) have received calls from consumers who have received a scam email, appearing to come from Insurance Commissioner David Altmaier, informing them that their insurance has been cancelled. The fraudulent email indicates that it is coming from the Office of U.S. Insurance Regulation and references DFS’s mailing address. The unauthorized email includes a link for consumers to view their policy information. This email is a scam. OIR does not send notices of cancellation and those who receive it should disregard the information. If you receive a similar email, do not open any links and do not provide any personal information; instead, immediately delete the email. If you are concerned about your insurance, please contact your insurance company directly using a number you know to be legitimate, such as the number found on your insurance card, bills, or policy. Consumers should report this scam and all fraudulent activity to the Department of Financial Services’ Insurance Consumer Helpline by calling 1 (877) 693–5236. The Helpline is also available to consumers who have insurance-related questions or need assistance with the filing of post-storm insurance claims. Taylor County officials have received several calls regarding a scammer who is claiming to represent the Federal Emergency Management Agency (FEMA) and demands a deposit of $150 in order to initiate the claims process. FEMA does not require a fee to file a claim; do not provide payment in order to start a claim with FEMA. The Department’s Divisions of Investigative and Forensic Services and Agent and Agency Services have teamed up with Taylor County officials to investigate. Official Florida’s State Emergency Response Team (SERT) and FEMA team members will carry identification and may request information about your damage or insurance; they will typically not request personal information such as Social Security Numbers and should not ask for a fee to initiate a claim. If you receive this scam call or are approached by someone fraudulently representing FEMA or SERT, please dial 1-877-MY-FL-CFO (693-5236), or 850-413-3089 if you are calling from an out of state number. You will be asked for contact information that will be delivered to the investigators so they may follow up with affected consumers as necessary. The Department of Financial Services was recently notified of a series of fraudulent phone calls that have the appearance of coming from the Department’s Division of Treasury's main line (850) 413-3165. The callers are claiming to be from the "Department of Revenue" and are demanding payments from the recipient of the call stating that they "owe them money". Spoofing, also known as “ghosting”, allows the fraudulent caller’s incoming call to show the Department’s number on caller-id so if one were to call the number back, they would be directed to our Department. This is done in an effort to legitimize the fraudulent scheme. The Department of Financial Services does not conduct any form of bill collecting or financial transacting in this manner. If you receive a call from the Department of Financial Services that matches this description or seems suspicious, please remember to hang up, and dial (850) 413-3165. Do not provide any information until you have called the Department back and have spoken to a DFS representative. If the fraudulent or suspicious call is being made to appear as a different Department phone number, please hang up and call the Department of Financial Services Consumer Helpline (In-State) 1-877-693-5236 (Out of State) (850) 413-3089. Florida consumers should be wary of fake emails that claim to be from the Office of Financial Regulation. These email messages indicate that the consumer is behind on a payday loan and threats of legal action are often made. Phone/E-mail Pitch: Scammers often identify themselves as “Officer Joel Winston” or “John Smith.” These individuals will use official logos, without permission, to create falsified email messages that appear to be very authentic. They claim the consumers have outstanding payments on a payday loan. Consumers are instructed to call a number, which typically contains a 904 area code, in order to resolve the issue. Result: Consumers that provide personal and financial information to these scammers via email or phone risk having their identity stolen or fraudulent purchases made using their accounts. How to avoid this scam: Do not immediately respond to emails that claim to be from the Office of Financial Regulation. Be on the lookout for incorrect grammar, misspelling and vague information. Consumers should also inspect the author’s email address to determine if it is an official state government email address. Do not hesitate to contact the Office of Financial Regulation to report these fake emails. Visit www.flofr.com or call (850) 487-9687 for more information or to file a complaint. This scam claims to come from the Director or Assistant Director of the Department of Financial Services’ Division of Insurance Fraud. It requests personal information to help with an investigation or to avoid criminal prosecution. Email Pitch: An email arrives claiming to come from the Department of Financial Services’ Division of Insurance Fraud’s Director and/or Assistant Director. The message will include the Division of Insurance Fraud’s physical address and logo, but it is not legitimate. The email may claim that an item of great value was being sent to you and has been confiscated or cannot be delivered because it lacks the proper insurance. The email directs the consumer to contact an organization- in this instance, the Tucson International Airport- and provide personal information to avoid prosecution or confiscation of the item. The Division of Insurance Fraud will not ask that confidential information be sent over email, nor does it direct consumers to contact a third party to provide this information. Target: All consumers, particularly those who have insurance products in Florida. Result: Consumers who respond to this message risk compromising their confidential, personal information and becoming a victim of identity theft. How to avoid this scam: Do not respond to unsolicited emails asking for personal information and refrain from calling the phone number provided. If you receive an email claiming to be from the Department of Financial Services’ Division of Insurance Fraud asking for personal information, call 850-413-3115 to verify and report the email. Cyber security refers to protection from security risks like unauthorized access to networks, programs, information and data, and attacks or damage to computers and other devices. As cyberspace becomes more and more integrated into professional and personal tasks, it’s even more important to increase awareness on the topic, be aware of the risks that go along with online activity and take steps to increase cyber security. Identity Theft Scams - Through phishing, for example, scammers look to gain access electronically to personal information such as Social Security Numbers, credit cards and bank account information to open fraudulent accounts or make fraudulent purchases. Phishing is accessing personal data by posing as a legitimate organization or entity via email or a website. The goal is to install malicious software on your computer and other devices. Another way is through social engineering, which is convincing you to install the software by providing a link, pop-up advertisement or encouraging you to download something from a website. Tech Support Scam - In this scam, you receive a phone call or an email from someone posing as a computer support technician, typically from Microsoft or Dell, asking to remotely access your computer or download software to fix a problem. They will try to sell you software to fix your computer or install malicious software to steal your personal information. Once the scammer has access to your computer, they are able to change the settings on your computer that could leave it vulnerable to viruses. Chip Card Scam - The new credit and debit cards embedded with a microchip are designed to reduce fraud, but scammers see it as an opportunity to commit fraud. Scammers and cyber criminals try to capitalize on the delay in consumers receiving the new cards from credit card companies or financial institutions. In this scam, you receive an email or phone call from someone claiming to be from your financial institution or credit card company stating that personal account information needs to be updated so that a new credit card with a microchip can be issued in your name. The scammer states that this can only be done by confirming some personal information or clicking on a link within the email. Again, once you click on the link, the scammer can unleash a virus onto your device that provides access to personal information. Lottery Scam - In this scam, a cyber criminal may contact you by email claiming that you have won a prize or the lottery. They may request your bank account information to wire the prize money. You may also be asked to click on a link or attachment to claim the winnings. Again, clicking on the link or opening the attachment could download a virus onto your computer or other devices. Links or attachments in emails with no text. Incorrect website URLs or slight variation in the company name. For example, instead of www.BankofAmerica.com, the site is www.BanksofAmerica.com. Alarming messages and threats of account closures. Promises of money for little or no effort. Deals that sound too good to be true. Requests to donate to a charitable organization after a disaster that has been in the news. Remain defensive about sharing your personal information. Do not provide your credit card number, password or personal identification number (PIN) over the phone or internet unless you have verified the requestor. Use PINs and passwords that are difficult for others to guess and include symbols such as # or %. Do not allow anyone to access your computer remotely unless you initiated contact and requested assistance. If you receive an unsolicited call or email from your credit card company or financial institution, hang up and call the company directly. Avoid clicking on links or opening attachments in emails unless you have verified the identity of the sender. Even if you know the sender, if an email looks suspicious or unusual, contact the sender directly to confirm they intended to send you the email before opening attachments. Check financial statements for fraudulent purchases and errors. Check medical records for incorrect charges and services. Be sure to shred them before throwing away. Request and review your credit report annually. Get a free report every 12 months from www.AnnualCreditReport.com or 1-877-322-8228. Look for unauthorized accounts and report suspicious activity immediately. When making online purchases, use secure websites. The URL should begin with “https” (the “s” stands for secure) or there should be a lock symbol. If you are using free, public WiFi to connect to the internet, avoid online banking and other personal accounts that require you to provide private information such as your passwords, PINs, Social Security Number, etc. This will decrease the risk of a cyber criminal accessing your personal information. When possible, access a secure WiFi network that requires a password. Use products and devices aimed at protecting your privacy such as RFID (Radio Frequency Identification) blocking sleeves or wallets. These items make it difficult for identity thieves to scan and obtain your personal data from your driver’s license, and credit and debit cards. To report cyber crimes and other scams, visit the Florida Trade Commission’s Complaint Assistant. For information on additional scams and cyber crimes, visit the Department’s Frauds and Scams page. The Florida Lottery reported that scammers have been sending emails using the department's logo and letterhead claiming the recipient has won a monetary prize. To claim a share of the funds, the email requests that the recipient contact the person listed, provide financial information and pay taxes. Florida Lottery officials will not contact players unless they have entered a game or drawing on the official Florida Lottery website or social media sites. Remember, you can’t win if you didn’t enter. To report a lottery scam, contact the Florida Lottery's Division of Security at 850-487-7730. If you or someone you know has been a victim of a financial scam please call 1-877-MY-FL-CFO (639-5236) or REPORT FRAUD now. Floridians who have received a warranty offer from HomeServe USA Repair Management Corp. are urged to carefully review the offer for an “optional service plan.” The Miami-based insurance agency is reported to have mailed notices to 600,000 Florida residents in November 2012, and consumers are complaining that the notice looks like a bill from a government agency. Click here for an article about the complaints. The Division of Consumer Services has provided a list of suggestions to the National Association of Insurance Commissioners on steps to improve the recovery process for disaster victims. Click here to read the list of suggestions. We have encountered an insurance agency located in California who sold commercial property and liability policies in Florida without being licensed. The policies sold were bogus. Please call the Departments' Insurance Consumer Helpline at 1-877-MY-FL-CFO (693-5236) if you believe you or someone you know may have purchased a policy from this agency. As always, please verify the product you are purchasing before you buy it.